By the end of Monday night's City Council meeting, some of the dais-holders seemed nearly giddy at the prospect of a meeting ending three hours sooner than many had expected. Indeed, the Council quickly dispatched with a number of controversial items -- with that expected to be most divisive perhaps, the 15/501 Business road diet, sailing through unanimously. See how the sausage got made after the jump. A $30,000 Leaf should soon be alighting on the Great Lawn at Durham Central Park. “I think it’s going to energize the east side of the park,” said Ellen Cassilly. She’s a Durham Central Park board member and an advisor to a dozen North Carolina State University master’s of architecture students who have designed and will build the structure. It will double as a shady seating area and a performance stage, and it may also allow a projection screen to be hung from or mounted on its eastern side. The object will feature built-in wooden benches and a foundation and steps that can double as seats. The structure can also accommodate a canopy to block the sun; the canopy can be adjusted or removed as needed. The object measures approximately 37 feet long by 17 feet wide. The upright wooden fins that define but don’t enclose the “building” will stand some 14 feet tall. It’s been dubbed the Leaf due to the shapes mimicked by the collection of fins as well as the by concrete pad around which they will be arrayed. “Sculpturally, this thing is absolutely beautiful,” said Erik Mehlman, another advisor to the N.C. State class. “I’m still completely enamored of this,” he added. Man’s best friends will soon have a new local spot for taking in fresh air and stretching their legs. The Cleveland-Holloway Neighborhood Association and the Durham Parks and Recreation Department have formed a novel partnership that will result in the opening of downtown’s first play space intended especially for canines. The Downtown Durham Dog Park will be located on vacant city-owned land at North Roxboro and Elliott streets. The site is west of Queen Street, north of the Scarborough Nursery School and across Roxboro from First Baptist Church. A community cleanup day has been scheduled for the morning of April 23; the park should open to the public by early May. Dragana Lassiter, 30, is pursuing a doctorate in cultural anthropology at UNC Chapel Hill. For nearly two years, she’s lived in Cleveland-Holloway with Asa, a mixed-breed male dog. After last week's rainy Sunday, most downtown neighborhoods that had luminaria nights scheduled have postponed until this weekend -- and though as a TP'er I'm biased, it's hard to imagine a better place to spend the night of lights than in Trinity Park's eponymous community spot at the corner of Watts and Main. The Trinity Park Neighborhood Association is sponsoring the annual event, but this year is moving it beyond front yards to the community green. From 4pm to 6pm, hot cocoa and cider will be available -- and so will treats from local food trucks including OnlyBurger, Rubio's taco truck, Farmhand Foods and Joey D's hot dog food, er, push cart. Santa will make a visit, and since his sleigh's in for repair (he wasn't expecting icy roads this far south this early in the season), he'll be riding in on a different red wagon, this one a fire truck. There'll be caroling, too; scout's honor your blogger won't be singing, thank goodness. 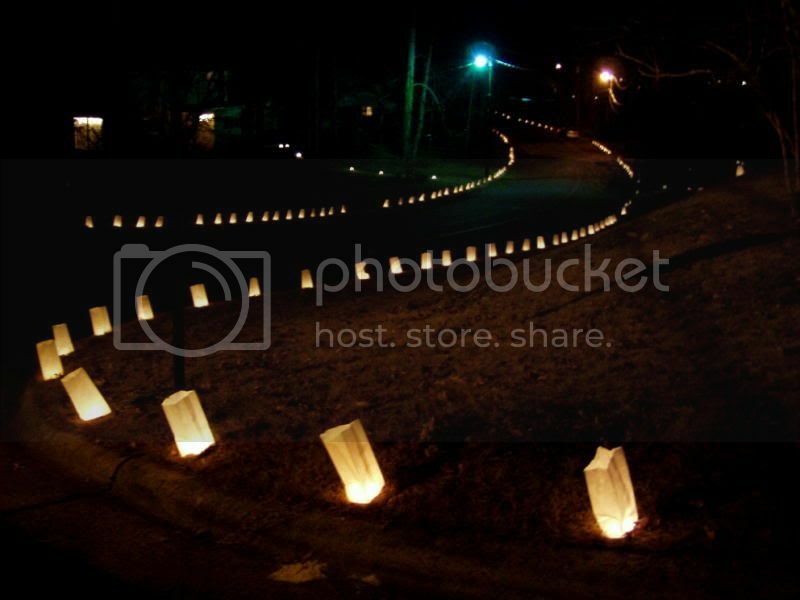 To light up your front yard with the sandfilled bags with a candle, supplies are available for sale at the porch of 302 Watts St.; $1 per set, with proceeds benefitting a local family through the Share Your Christmas program. Organizers will be collecting cash donations at the park as well for Share Your Christmas, and accepting unwrapped presents to be donated to Toys for Tots.